Hi there! Well, it’s been a while again… Lately life hasn’t been too much fun. Just a lot of stuff isn’t the way I’d like it to be and I often have trouble imagining that I’ll ever be free to live my own life…. Well, to escape from all that drama, I usually make stuff. 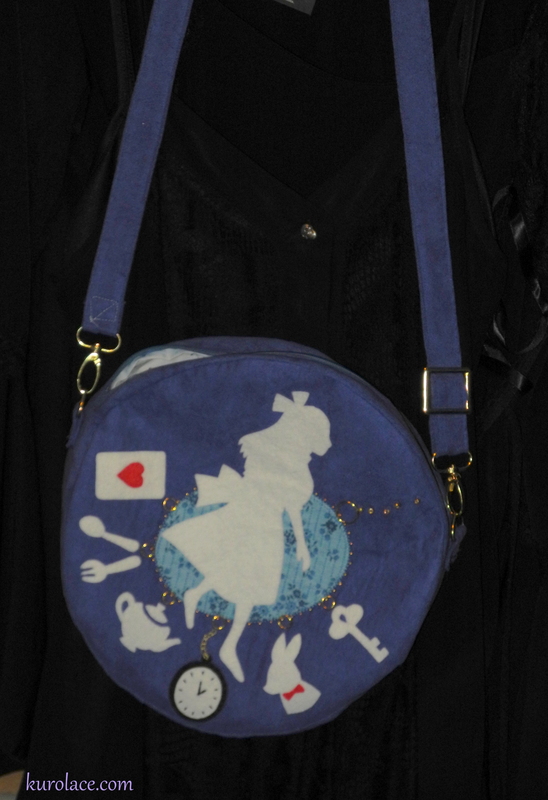 Lately I discovered a Chinese book on handbags which all have fairy tale themes. 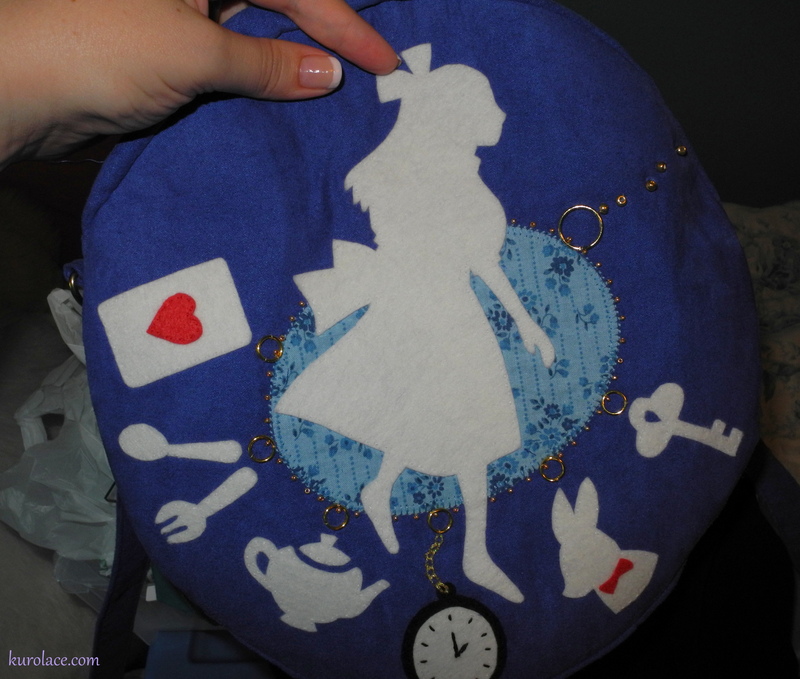 I don’t read Chinese, but I was able to combine the images with my own sewing know-how to make a very cute Alice in Wonderland themed bag. My mom wanted to know how much I’d sell it for, but this first one I’ll probably keep (its not as professionally finished as I’d like it to be). If I do make another to sell, I think it would be in the $50 range. Does that seem too expensive? Keep in mind, all the applique has to be done by hand! There wasn’t a pattern for the actual bag, so I had to make it up myself, and I’ve never sewn in-the-round like this before. I had to do the bag twice actually, because the first time I somehow messed up my circumference measurements. 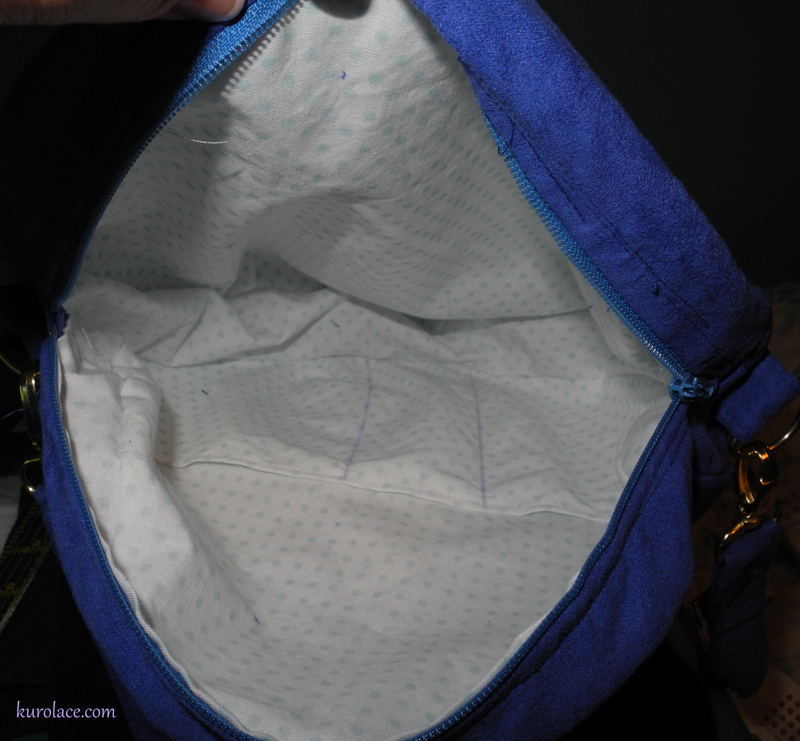 The bag is 10.5″ in diameter, made from faux suede with interfacing (to stiffen it) and a cotton lining. The strap is long enough to be worn cross the body (my preferred arrangement), or can be adjusted to be shorter. The applique are done with a lovely 60% wool, 40% rayon felt (a Japanese brand). There’s gold colored beads, key-chain rings, and gold embroidery thread for the charm-bracelet design. There are a few things I’ll fix for next time. I meant for the tabs which attach the D-rings to the bag to be in the seam, not sewn on the outside of the bag, but I forgot to do it, and then having done the bag twice, I got lazy and just put them on the outside. The strap could stand to be about 3 inches longer, really. And on the applique I think that I’ll do the embroidered chain (on the watch) for the top chain part of the charms bracelet (the little row of beads leading towards the upper corner of the bag). I wanted to add a fur ball pom pom key-chain (they show it with one in the design book), but I’ve been frustrated by the fact that I can only find real-fur ones, not faux ones. Idk… I’m not strictly against fur, but since I used faux-suede, I think adding a real-fur accessory would be rather odd. The bag which came up in my search results is this rosebud bag. There are some other interesting bags, including gourds, artichokes, and this “opening seed pod” bag. And these stone bags are really neat. Widely recognized as one of the world’s leading polymer clay artists, Kathleen Dustin has been a pioneer, an educator, and source of inspiration for those interested in this emerging medium. Her exquisite evening bags and polymer clay jewelry are celebrated for their translucent depth of surface and vibrant colors as well as attention to the details of the natural world that inspires her. Kathleen’s desire is to make wearable art that can enable anyone to embrace Oscar Wilde’s sentiment, “One must either be a work of art or wear a work of art”. There’s also sculpture and jewelry listed on the page’s gallery, but for me its the handbags / purses which catch my eye most.